Enter General Service Provider information including contact information, carrier interface configurations, and accounting specifications. To access the Service Provider General Screen from the menu bar of the main TeleTracker Online screen, click Master Files, then Service Provider. Select the appropriate Service Provider and click Open. Click the General button on the left side column menu. Click the link. To open an existing Service Plan, double-click or select it from the list and click Edit. Click Add to create a new Service Plan. A located next to the link indicates that one or more required fields needs to be filled in or configured. Required fields will be shown in Red. Code : Enter the desired code for this Service Plan. The code cannot contain any spaces or special characters. Description : Enter the description of this plan. This description will been shown on the customer invoice. Valid From / Valid To : Enter the dates for which this plan is valid. Air Time Rates / Times : Enter the appropriate rates and times. Please note: These fields are for reference only. From Provider Calculation Method : Select the Retroactive option if your Service Provider pays receivable commissions retroactively. Select the Tiered option if your Service Provider pays receivable commissions on a tiered basis. From Provider Counts From : Select This Plan for TeleTracker Online to calculate activation counts for THIS PLAN ONLY. 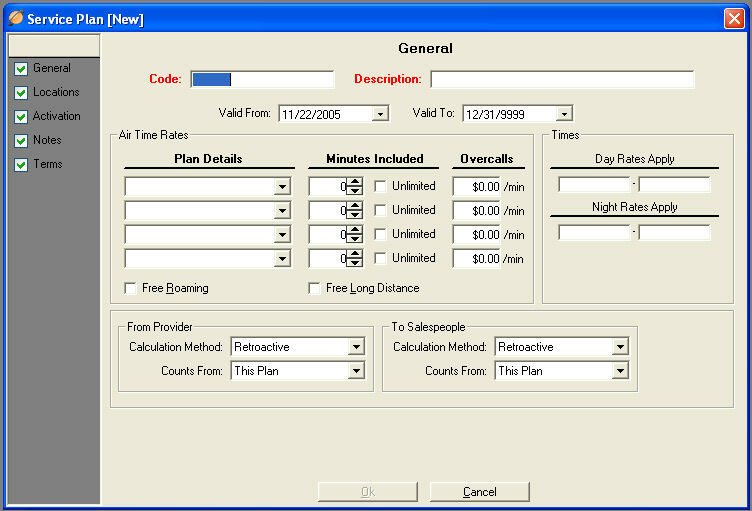 Select All Plans for TeleTracker Online to calculate combined activation counts for all plans selected with this option. To Salespeople Calculation Method : Select the Retroactive option if your Salespeople are paid commissions retroactively. Select the Tiered option if your Salespeople are paid commissions on a tiered basis. To Salespeople Counts From : Select This Plan for TeleTracker Online to calculate activation counts for THIS PLAN ONLY. Select All Plans to incorporate this plan's activation count with all plans under this Service Provider. Select All Providers to incorporate this plan's activation count with all other Service Provider activation counts. Make the appropriate selection from the Valid At drop down list. A selection of Company Wide specifies that this Service Plan is valid for all locations. Any other selection (Location, District, Market, Region) will populate the corresponding entities in the Available column. Highlight the entities for which this Service Plan is valid. Use the arrows (>) to move the selected Location Entities to the Selected column. You may remove locations from this Service Plan by highlighting the entity in the Selected column. Use the arrows (<) to move them back into the Available column. Specify the Valid Activation Types for this Service Plan. Click the link located on the left side of the window that says Valid Plans. A list of all of your Activation Types will been shown in the Available Column. Highlight the Activation Types for which this Base Incentive is valid. Use the arrows (>) to move the Activation Type to the Selected column. You may remove plans from this Service Plan by highlighting the Activation Type in the Selected column. Use the arrows (<) to move them back into the Available column. Enter applicable notes for this Service Plan. These notes can be printed on the Invoice when this Service Plan is activated. For information on Service Plan Terms, please visit the Service Plan Terms help page.